This is a set of two tapestries of similar size and with a gallant theme, which probably arrived at Oncala parish church as part of the sixteen pieces donated in around 1800 by Juan Francisco Ximénez del Río, Bishop of Valencia and a native of the town. With the passing of time, the religious or mythological themes typical of 15th century tapestries started to make room for other kind of scenes, especially romantic scenes. In the case of these tapestries, the source of inspiration has not been established. It may have been Virgil’s Eclogues, although a more likely source is L’Astrée, Honoré d’Urfé’s lengthy novel published in instalments from 1607, which tells of the loves of the shepherds Celadon and Astrée. The work was widely circulated and, in fact, Frans van den Hecke, the weaver of the Apotheosis of the Eucharist tapestries, also made a series of six tapestries on this theme. Celadon, a shepherd just like Astrée, by chance obtained her green ribbon — and so this light shade of green was named ‘celadon’, from the French vert-céladon. The encounter between them could be the romantic scene represented in one of the pieces. 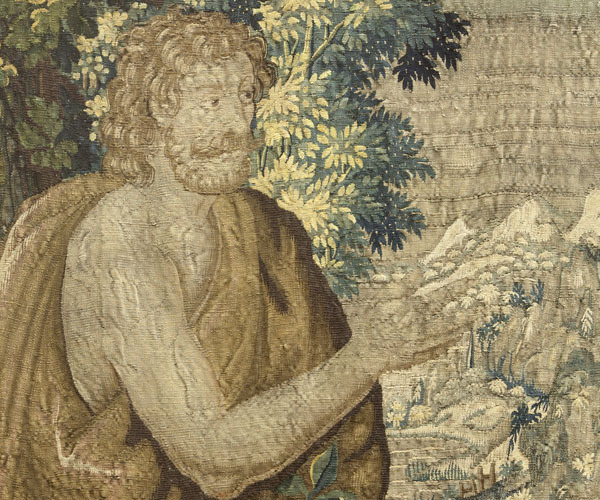 The other tapestry may recount the nymph Galatea’s attempt to seduce Celadon. We can only ascertain that the tapestries were woven in Brussels, as indicated by the mark B▼B in the lower selvage of both pictures. 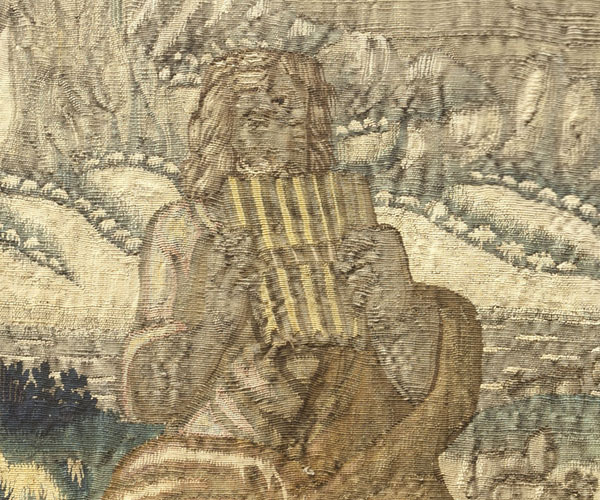 There is no monogram of the weaver, nor could the author of the cartoons be identified. The signs at the top and bottom lack inscriptions. 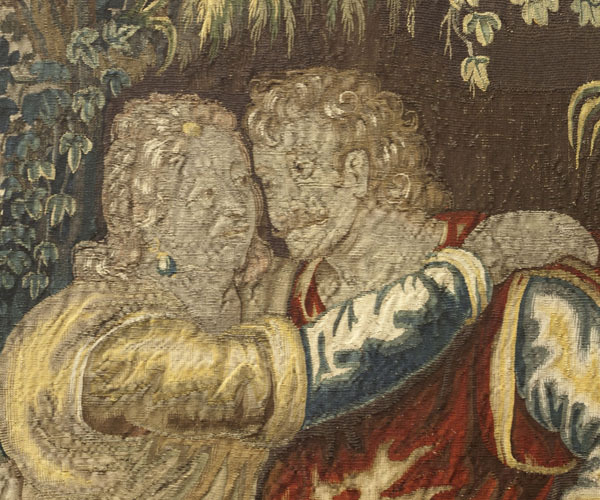 The structure of both tapestries is identical: a scene with two characters placed in richly teeming nature, treated in much detail. In the background of the first one, a shepherd plays the panpipes, while in the second two women dance. 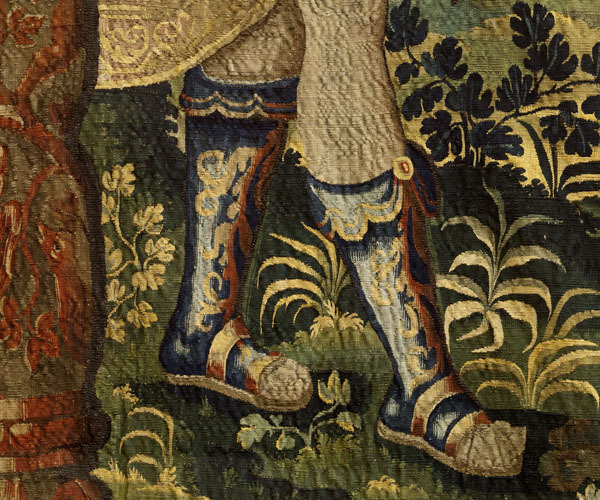 Because of their style, they can be dated to the first years of the 17th century, when Renaissance decorative elements were still frequent, although the realism with which nature is treated points to possible manufacture in later decades of the 17th century.